The final Australian Super Rugby franchise the Rebels have named their strongest available team to play the British and Irish Lions on Tuesday at AAMI Park. The Lions have played four of the five Australian Super Rugby franchises and only the Brumbies have beaten the tourists to date. 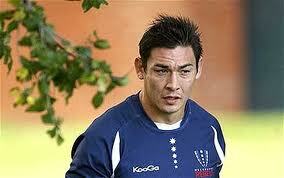 Welsh number eight Gareth Delve will captain the side in Tuesday’s match in his final season with the Rebels. Halfback Luke Burgess who only recently returned from France has been named in the starting side for the historic match. Burgess’ last start on Australia soil was almost two years ago to the day, with the 37 Test veteran marking the Australian Lions Tour as one of the key reasons for his return home. With Wallabies Kurtley Beale, James O’Connor and Nick Phipps unavailable for selection due to national selection, the Rebels also welcome the return of Hugh Pyle and Jarrod Saffy into the starting XV, after both returning from injury. Rookie flyhalf Bryce Hegarty returns to the run on side, after missing the Rebels’ previous match due to illness, having started against the NSW Waratahs and Stormers in recent wins.